Welcome (and Happy Release Day to) guest blogger, Heidi Chiavaroli! I remember the moment clearly, as if it were yesterday instead of eleven years ago. The kids were taking naps and I lay on my bed, sobbing, thinking of the conversation I just had with a person I respected. In the last hour, this person had seemed to effectively disprove the evidence of my faith. 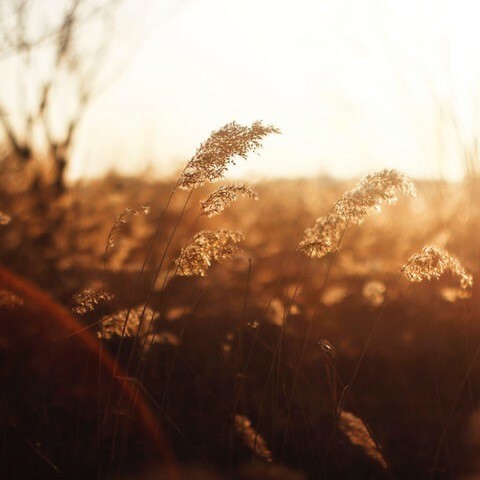 I was a new Christian and I couldn’t deny the hope my recent faith in Jesus had given me. Now, though, looking at what appeared to be true evidence that discredited the crux of my faith, I wondered if it had all been a lie. I wondered if I’d been fooled, duped. If I’d only conjured up this sense of peace and light and hope enveloping my being. Doubts gained entrance to my soul, and there, I plummeted into a pit of darkness. I remembered crying out to God. It wasn’t that hour, but very soon after He did just that. With a lot of seeking, a lot of counsel, a lot of prayer, God did indeed show up. After coming out of that spiritual battle, I felt I had scars aplenty. And yet I knew I was stronger. God had not abandoned me. Instead, He not only proved Himself, but He shone His light and hope into a deeper place in my soul. Our characters and our stories should speak truth and authenticity. I think if we’re honest, we all struggle with doubts and questions once in a while. It’s that in-between dilemma—that place between the now and the will-be promise that God has given us, where our real selves are hidden with Him. If we ignore this truth in our fiction, then we are not creating true-to-life characters, but merely neat cardboard cutouts. Yes, many people in real life have amazing faith and they are to be admired, but how did they obtain that faith? More than likely, it was through trial and perhaps times of doubt and questioning. To reach more readers for what truly matters. I consider my stories far from preachy, and yet I hope they gently weave the message of the gospel in between their pages. In my sophomore novel, The Hidden Side, the Abbott family tries to come to terms with the unspeakable actions of one of their family members. Quite honestly, as a mother, I can’t think of a circumstance that would be worse than the one the Abbotts face. And yet they are a family of faith. I wanted to explore, with authenticity, how this would play out for them. While I would like to think my faith is strong enough to stand against anything, I know from experience how liable it is to be shaken. If I want my stories to touch readers, I can’t pretend my characters won’t go through the same when trials come. Yet so often, in my experience, doubt has been a threshold to a deepened faith. That’s what I want to show in my stories. Our God doesn’t need a fake faith—in our lives or in those of our characters. If we ignore our questions and doubts (and if we allow our characters to do so as well), we’re not being real with ourselves or with God. Our God doesn’t need a fake faith. He’s the Almighty, the Creator of all things. He can handle our doubts and questions. Really. And I absolutely believe He will use them to strengthen us as He did for Thomas, Abraham, and many others in Scripture. As an author, I don’t want to discredit God’s power and ability to work through any and all situations. Our world is rife with places that many consider dark and hopeless, and yet this is where Jesus went. He never ignored the ugly. He never ignored the doubt. Instead, He shone His light into it. And always—always—it held up, because always—always—Jesus holds up. That, more than anything, is the goal and responsibility I charge myself with when writing a book: to go to the dark places. Those places of hopelessness and evil and doubt and disbelief. 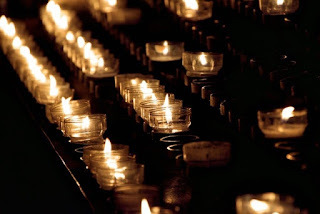 Go there, and shine light and truth. Have you ever struggled in your faith? If so, how has it affected your journey and your fiction? What do you think of the importance of allowing your characters to have questions about their faith? 3 out of our 4 family members researching for The Hidden Side in Setauket, NY. Here we are at Patriot’s Rock, which makes several appearances in The Hidden Side. 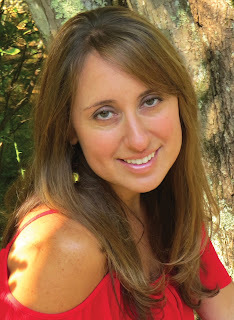 Heidi Chiavaroli began writing eleven years ago, just after Jesus grabbed hold of her heart. She used her two small boys’ nap times to pursue what she thought at the time was a foolish dream. Despite a long road to publication, she hasn’t stopped writing since! Heidi won the 2014 ACFW Genesis contest in the historical category. Her debut novel, Freedom’s Ring, was a 4½-star Romantic Times Top Pick and a Booklist Top Ten Romance Debut, and her latest novel, The Hidden Side, is scheduled to release in May 2018. Heidi loves exploring places that whisper of historical secrets, especially with her family. She loves running, hiking, baking, and dates with her high-school sweetheart and husband of fourteen years. Heidi makes her home in Massachusetts with her husband, two sons, and Howie, her standard poodle. 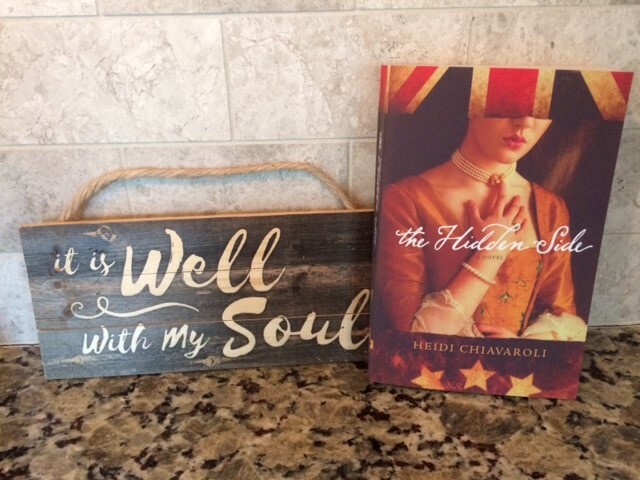 Heidi is offering a copy of The Hidden Side and this lovely 'It is Well with my Soul' wall art to one of our commenters today (US only). I must say I am very interested in reading your book. I am very reluctant, however, to deal with crises of faith unless that is what the story is about and then I find the theme to be very problematic. One of the biggest complaints about classic 'dialogues with the devil,' as Mark Twin and C.S. Lewis and many other famous writers have written, is that the devil too often 'got all the good lines' or made 'all the best arguments'. Many objective critics claim that the devil won the arguments. Many of these critics were Christians themselves who felt the author really was on the side of the devil! The Christian writers, of course, will always disagree thinking they won the debates. This is because they already believed their arguments were conclusive when they started and for them their arguments have worked in eliminating their doubts -- so they must be true. They were tested by the author and they worked (for them). However, many of the readers of these faith arguments with the devil discover that the arguments simply created more doubts…or even worse, create doubts they didn't have before they read the novel! I would ask any author who creates doubts in a lead character this: are your counter arguments so good that they will win back the reader who believed the doubts to faith the character had were valid? I favor showing how a strong faith in living according to Christian values makes life better for characters facing problems. Demonstrate the value of faith in action. Unless you are a theologian you don't have to prove your beliefs. You only have to explain their value to the believer. Well, at least that's one point of view. Thank you so much for stopping by, and for your comment. You bring up some interesting points! I suppose in writing a novel, I don’t think of my characters as vehicles through which I need to argue the points of my faith. I consider them representatives of authentic people going through a journey. This journey will vary widely depending on the character. Real people do have crises of faith. If we ignore that or steer clear of it in our fiction, then we aren’t portraying the real struggles of this life and trusting that God is strong enough to work them out. And yet the eternal and spiritual peace, the beautiful hiding place he gives us in times of trial, I believe, is worth this hardship and suffering. This is what I hope to show through my stories and which, I believe, is of ultimate worth. Interesting thoughts, Vince! I guess I, too, think of my novels as a journey for my characters--including some doubts along the way with some characters. The characters aren't trying to prove or disprove faith. They're just living out their faith the best they can through good times and bad. And of course they usually grow along the way. Thanks for your comments. There is a difference between when the author is presenting the best case for and against the existence of God and when the doubts are just specific to the character and that character finds his faith in some way along the character ARC. I'm very interested now in reading how you handle these things and I just ordered a large print version of "Freedom Rings". I look forward to reading it. Good points, Vince. Thank you again for your thoughts, and for ordering "Freedom's Ring." I'm interested to hear your thoughts. :) Blessings! Congratulations on your new release! I'll have to look for your books! And you've tackled an interesting subject. Like Vince pointed out in his comment above, many readers want to see strong faith in the characters in Christian novels, but as you said, it's also important to portray reality. Our faith is strengthened in trials, and they bring us closer to God. Thanks for being in Seekerville today! Thank you so much for stopping by, Jan! "Our faith is strengthened in trials, and they bring us closer to God." - exactly, Jan! This is a very interesting topic, Heidi. Thanks for bringing it to Seekerville today! I think, as with almost anything, there needs to be a balance between faith and doubt in our stories, just like there probably is in our lives. I always want to show my Christian characters as strong in the faith, but the truth of it is, I’m a Christian and I don’t always make the right decisions, and I don’t always have unshakable faith. Often non-believers will say that Christians act like a person has to have it all together before they come to Jesus or come to church. How do we tell stories that show real people, struggling to get it right without making them hypocrites? I’m not sure I have an answer to it, but I’m going to keep trying. Thanks for making me think—that’s pretty deep stuff before I’ve even had my coffee! Would love to be in the drawing for your book. It sounds great! it's a very thought-provoking post, isn't it? With or without coffee lol! I always think about the two men in the temple--the Pharisee and the tax collector. The tax collector didn't try to hide his sin--he KNEW he was a sinner. I think it's important to admit that we don't have it all together, that we need Jesus just as much today as the day he first came into our lives. I try to keep this in mind as I craft my characters. Good morning, Heidi, and welcome to Seekerville. You have, indeed, brought up an interesting subject. But one that is not unfamiliar to some folks, like yourself. And while I agree that it would be a tough subject to write about, I also believe that if God called you to write about it, He will equip you. Carrie, I am so glad He does. Carrie, I totally agree about including characters who struggle with faith so we make our readers who struggle know they're not alone. Great point! Great post! My faith struggles have definitely showed up in the characters of my books. I feel like my faith deepens as I walk along side with the characters as their journey explores their faith and what it means to be a believer. I love the faith struggles in your books, Toni - it really adds to the authenticity of the message! Toni, so great to meet you here! And I ABSOLUTELY understand the experience you have with your characters. So nice to have a bond over this, even if we don't know one another very well (yet!). I will have to check out your books, which I've heard GREAT things about! Toni, welcome! I have had the same experience in walking a journey with my characters. I often find that the things God is working on in my life appear in my stories. God teaches me through the writing! Heidi, a thought-provoking post. That's why I love the Bible, it covers the entire spectrum of human emotions including doubt. The difference between Thomas and Judas. Thomas doubted but had his beliefs restored and went on to spread Christianity across his known world. Judas, alas, didn't. Some of my characters don't know the Lord when I begin to write, but the ones that do have their struggles. In the contemporary Christmas romance I'm working on, Paul THINKS he's trusted God in the aftermath of his young wife's death in a hit-and-run. But when he reconnects with his high-school unrequited love and finds the part she played in it, everything he ever believes in on the table. In the historical I've just contracted for (MY FIRST) Caroline is a Christian when she goes on the Oregon Trail, but she struggles with why God allowed her husband to die--and why God allowed her first love and betrayer to also be on the wagon train. She has faith but it's far from perfect, and God does a lot of reshaping of her on the Trail. Have I had doubts? Yes, but fewer over the years as I look back on how He has provided and protected me. I underline stuff in Bibles and make margin notes, I'm one of those, and it's so exciting to me to reread a passage and see the notes, such as "June 1, 1984." I don't even REMEMBER what the problem was on June 1, 1984, so He must have gotten me through it. Will be in and out today, more in than out as I am home shoring things up before heading back to temp job. "That's why I love the Bible, it covers the entire spectrum of human emotions including doubt." - so true! Very well said. I agree with Carrie, very well said. Our adult Sunday School class (they call it discipleship now, whatever) is studying the life of David and he is a prime example, he experienced EVERY human emotion including doubt. But he didn't wallow in it. We need to seek the Lord's face and move on. "Lord, I believe; help Thou mine unbelief." Kathy, I like that direction not to wallow. And to cling to Scripture. Oh, Heidi, FYI, I am a New Englander too, I live north of the border from you in New Hampshire, of all places. CONCORD NH? Bring it on, I'm from there, it's a 40-minute drive from where I live now, and my daughter and sister still live there. Where? Gibson's Bookstore? BAM? Some church? Give me details! Writers I know from the Net seldom wander up this way (unless it's Josee in Vermont, who I guess would wander down). Let me know, if I'm not working I'll show up. New friend Kathy! How exciting that you're from there! It's at Parable Bible Bookstore (they are SO great! ), June 23rd at 10AM. They will have details up soon on their facebook page, I believe. I'd love to meet you, but no pressure if you can't make it. :) Either way, wonderful to "meet" you! I know where Parable is. It's off Manchester Street. I'll see what I can do. Heidi, welcome! I'm so glad you're with us today. This is such a great post. As I said to Toni, above, I've experienced God teaching me, through writing my stories, about things I'm struggling with. As I struggled with feeling unlovable, one of my characters had to learn that God loves her no matter what. As I struggled with control issues (I'm a control freak! ), one of my characters had to learn to let go of the reins and trust God's plan. Things like that have happened over and over for me. I don't think I've written a character yet who has a true crisis of faith. However, I have written one or two who thought God didn't really care about them. I experienced that form of doubt years ago after having a miscarriage. It was a terrible time for me. In my current wip my main character has some horrible things happen in her life. Her faith remains strong as she struggles with forgiveness and anger toward the person who harmed her. I wanted to make her character strong so readers can see it is possible to depend on the Lord because He is our source of strength. Thanks for stopping by, Wilani! You bring up an interesting point, because even if we aren't consciously doubting God's love or if He's working in our lives, when we harbor anger or unforgiveness (or any type of sin) it is a form of unbelief. I know when I can't forgive someone, I am not TRULY believing God is enough to handle my circumstances. That is a form of doubt. So interesting! Thanks so much for bringing this into the discussion, and for commenting, Wilani. All the best with you and your stories! I have struggled and have become stronger for it. I think it’s good for the characters to struggle....that struggle makes faith more real and personal. I think those times that we do struggle, we come through on the other side stronger - you're so right! Absolutely! Thank you so much for stopping by, MJSH! I love that you brought this up, and that you shared your own testimony. I can't say I've had doubts, per say, but my faith has definitely seen some ups and downs. Only recently (in the past few years) I've started realizing the difference between a relationship with Christ and a shallow faith. Because of this, I've weaved this "maturing faith" theme in my current series. I do think it's important we show the character's faith walk. I have a general market audience, so I'm not heavy with my Christian themes, but I want to at least introduce the concept via my characters. If they see struggle and growth, hopefully they can relate better, yet learn how people ultimately put faith in the center of their lives. This is beautifully said, Anne, and I admire all of it. :) Blessings on you and your writing! Anne, I love that your characters are living their faith in your general market stories! Hello Heidi, you're a "new to me" Christian author and I love the premise of your new book! I will order it from my local Christian bookstore. I like to support them instead of Amazon. And I'm Canadian so don't put me in the draw...but to your question, I absolutely think we need to show characters struggling with their faith in our stories. It's real life and people are deeply hurt through the loss of children, fertility, jobs, cancer, early death of family members, you name it. We all question why? We write to minister to other Christians as well as to non-Christians. And everyone deals with a crisis of faith differently so should every character in our stories show how to deal with it. I'm so glad you wrote this enlightening post. Thank you and congratulations on your release! Laurie, that's so true that deal with crises of faith differently. That makes room for writing our stories many different ways. The Hidden Side looks like a really good book. I read all kinds of things and there are times when a book about someone going through a struggle and needing to bolster their faith hits the spot exactly :-) Plus the revolutionary time period looks very cool. Thank you so much for stopping by, Jenna, and for your kind words. :) All the best! 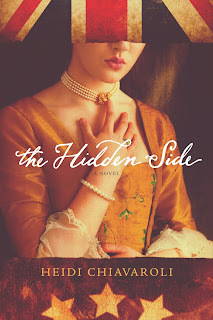 Congratulations on the release of The Hidden Side! So excited to see this book hit the shelves. I think struggling with our faith makes us stronger, and our struggles help us understand and be compassionate when others struggle. And all of our life's struggles, things we learn, how we overcome, can help us develop and understand our characters even more. Hey, Pam!! I very much agree. Our own experience can help us create realistic characters--so true! Interesting topic, Heidi. I’m a cradle Methodist, so church has always surrounded me and faith was a given as I grew up. But as you mention, when we experience life, doubts can cloud our thoughts. When I lost two babies after years of infertility, I questioned “Why me?” If God is all powerful, why does He allow bad things to happen? After years of praying about this, I can acccept I may never have the answer. I’ve also had many miracles, so I do believe God’s plan for all of us is His perfect plan, even if we don’t recognize it at the time. So, yes, our characters should experience and grow through the struggles of faith because our Lord blesses us with renewed strength when testing our beliefs. Congratulations on your new release! I admire authors who tackle the dark topics confronting our world. Reminders of hope are so needed. Blessings! Thank you so much for your kind words, Sherida, and your honesty. Very interesting, Carrie! Thanks so much for sharing a bit. Definitely food for thought! Leslie, I'm glad you stopped by! 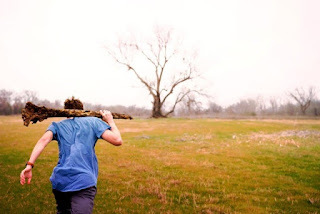 I think working through faith struggles could really help in writing devotionals. You'll be able to bring more understanding and offer more insight to your readers. Thanks, Heidi. You're certainly not alone! Missy, I hadn't thought about it that way, but you're correct. Thanks. Heidi, thank you for these brave, encouraging words. I became a Christian in my early 20s and it took me a long time to embrace my faith in my writing. I too struggle in hope that what I write shows His light instead of being interpreted as only a dark story. In the long run, if He sees our story as a masterpiece then that is what counts. This is beautifully said. I have discovered even when (or maybe even especially when) we think our faith is strong, it always has room to grow. I try to bring that out in my characters. I want readers to see that being a Christian isn't always easy, bit it is always worth it. I totally agree, Amy! I think when we feel like we have it all together, we're liable to be putting our trust in ourselves instead of God. Heidi, thanks for a great post. It is hard sometimes when God doesn't answer the prayers we have, but I know He is always faithful to us. In the book I'm writing, I have characters struggling with faith. I think people like to read books where the characters don't have it all figured out. Please put me in the drawing for the book and the wall art. I would love to win them. I wanted to tell you that I recommended Freedom's Ring to a church member when I was volunteering in the church library a couple weeks ago. She returned it this past Sunday and said she loved it. I have not read it yet because my book group is reading it this summer and I want to wait so I remember all the details well! I'm looking forward to it. Thank you so much for recommending Freedom's Ring! I'm so glad she liked it! And so exciting that your book group is reading it! If you have any interest in Skyping with me, I'm happy to do that. (No pressure!) You can contact me over on my website if that's something you'd like to do. Thanks again, Sandy! All the best! Heidi, my book group meets in a restaurant, so I don't know that Skyping will work. But thanks for the offer and I will keep that in mind. Wonderful post, Heidi! Thanks for sharing. Trixi, thank you so much for sharing your thoughts! I appreciate them and I very much agree with everything you said. I'm okay with a story not turning out exactly how the characters want it because to me, it speaks of authenticity. Thank you so much for your kind words, and for stopping in, Victoria! Tara! Thanks so much for stopping by! It is real life to have your characters struggle with their faith. 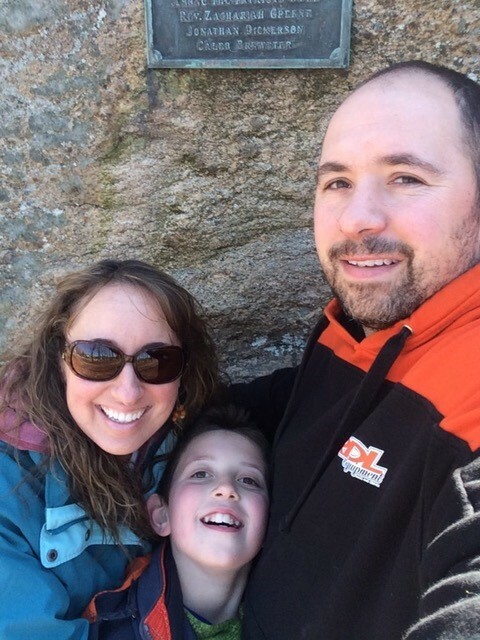 I had a season where I questioned and grieved over every decision I'd made raising my kids. Every step was a desire to raise up Godly men and women. Instead they all chose a different path. I felt I'd missed God's direction and my faith was fake. But God pulled me up straight. Told me to stop beating myself up with guilt. Their walk is theirs alone. I'd done my part. And then he opened my eyes to see how all those things had a positive effect on their character. Over the years some have come back to faith. Others have not but they know who to ask for prayer and advise. The characters in my novels struggle with doubt and unworthiness. Some struggle with similar issues my children have faced. Doubting our faith is part of our spiritual journey why not make it a part of our characters journey. Thank you for sharing your heart here, Jubilee (can I call you that?). I can understand your previous struggle and so thankful that God saw you through it. I am certain he is using your experiences in your writing. Blessings! Heidi, I'm so glad I got to read your post. I'm a Christian fiction author. In all 4 of my books, all of my characters struggle with their faith. Those who have read my books have told me they see themselves in the characters' struggles. One of them is about a rock star who becomes a Christian. It's called Wise Turned Foolish. Fay, that sounds great! And how wonderful that readers can see themselves in your stories--to me, that's what it's all about! I think it's great for both character's and people to have questions about there faith it's only human to do so. I agree, KIm. Thanks for stopping in! Congrats on your new release, Heidi, and thanks for the thought-provoking post. I've never really struggled with my faith, but I feel that at times it's stronger and more in the forefront of my life than other times. I enjoy reading books that show God working in people's lives. Thank you so much for stopping by, Winnie!